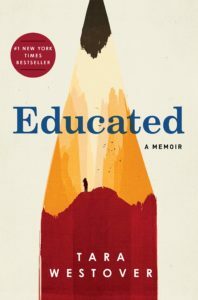 Educated, the juggernaut memoir by Tara Westover, needs no introduction, but for those who may have just returned from time travel or a few years of hibernation, it’s the story of the author’s life growing up in a extreme, survivalist Mormon family in Idaho. At 17, Westover managed to separate herself from her family and go to college at BYU and graduate school at Cambridge. The book is about how education – she never attended school until college – opened her mind to understand her family and how her upbringing had affected her, often negatively. Educated is a harrowing read, as there are many times when Westover and her parents and siblings were in grave physical danger, whether from a car accident or a gruesome accident at her father’s junkyard. Her parents did not believe in doctors or medicine and were deeply distrustful of government institutions like schools or hospitals. When her brother Luke suffered a horrendous burn when a fuel tank exploded, he was treated with natural remedies and painkillers. When her mother suffered severe head trauma in a car accident, she recovered at home, treating her frequent migraines with herbs. Westover also experienced physical and emotional abuse at the hands of her father and one of her brothers, leading to a near-constant atmosphere of fear and tension at home. She is honest about the impact this abuse had on her as a young woman: she tried not to feel anything at all so that she wouldn’t have to face the pain that they caused. I admire Westover’s remarkable resilience, as well as her clear, unflinching writing. Her ability to teach herself all that she missed growing up without schooling is astonishing. And her loyalty to her parents, despite their repeated failure to protect her from dangers at home or to take responsibility for the pain suffered by her and her siblings, is a testament to the power of family and upbringing. I am glad I read Educated, but I can’t say that I loved it. It’s not an enjoyable read, for sure, given the nature of her upbringing. But even beyond that, there is a coldness there, a distanced retelling of her family’s stories that makes it hard to appreciate their full impact. Westover is probably still processing all that happened to her, and the book is clearly part of that process of coming to terms. I am not sure that she is fully on the other side yet. I wonder whether the book would feel more complete if she had waited a few more years to write it, when everything was a little less raw. I listened to Educated on audio, and it was narrated by acclaimed performer Julia Whelan (aka the author of My Oxford Year and Grace Manning on “Once And Again”). Whelan won an Audie for Best Female Narrator for this performance earlier this year. Her narration was measured and unemotional, almost bordering on angry. I wonder how much her performance contributed to my sense of remove from the book, and whether reading it in print would have made for a different experience.